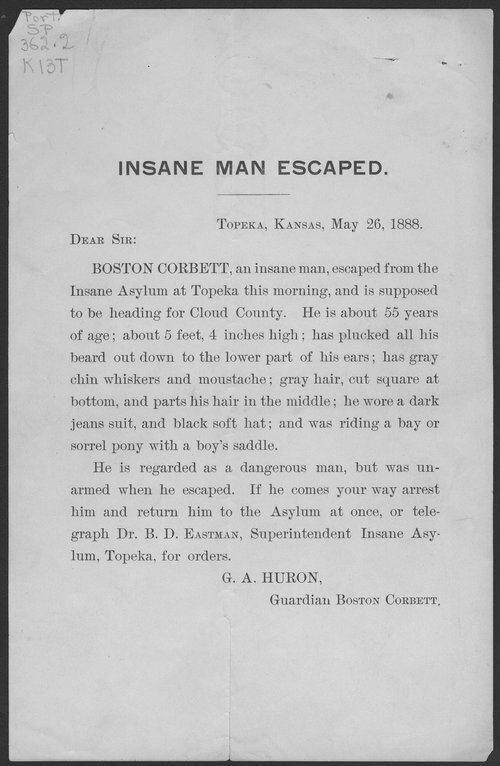 A poster titled "Insane Man Escaped" announces the escape of Boston Corbett from the Insane Asylum at Topeka, Kansas. Corbett, a former Union soldier, is famous for killing John Wilkes Booth, President Abraham Lincoln's assassin. In 1878, he establish a homestead near Concordia, Kansas. Corbett, who occasionally displayed erratic behavior, was hired as doorkeeper for the 1887 Kansas House of Representatives. While performing his duties, he pulled a pistol and unofficially adjourned the House. He was disarmed by local police, declared insane, and committed to the State Insane Asylum. On May 26, 1888, Corbett escaped on a stolen horse and after a brief stay in Neodesha, Kansas, disappeared.